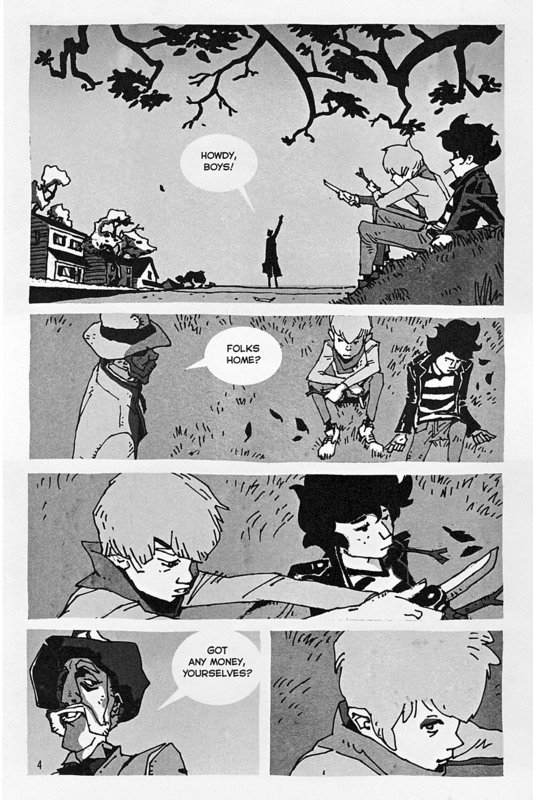 Something Wicked This Way Comes | Z-File, Inc.
Bradbury’s classic coming-of-age/loss-of-innocence story is graphically adapted by award-nominated comics illustrator Ronald Wimberly. The story of two thirteen-year-old boys and a dark carnival that comes to a Midwest town one creepy Halloween features Mr. 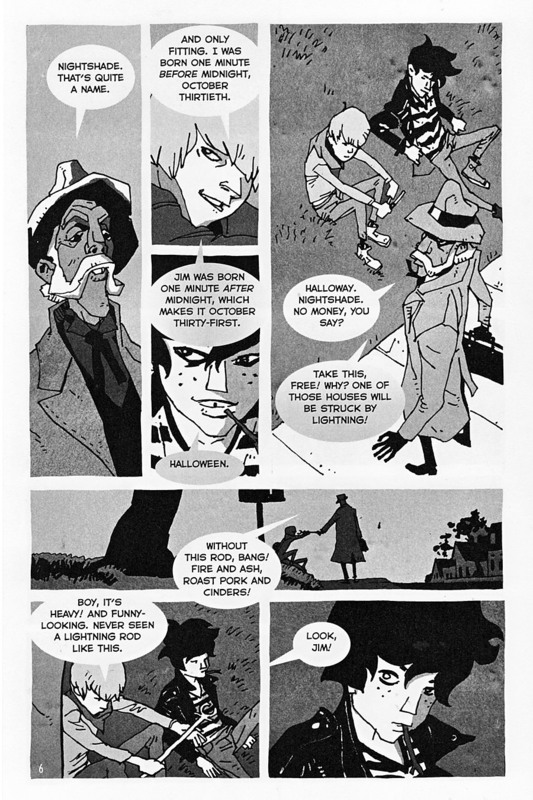 Dark, the Illustrated Man, first introduced to readers eleven years earlier in his own short-story collection. 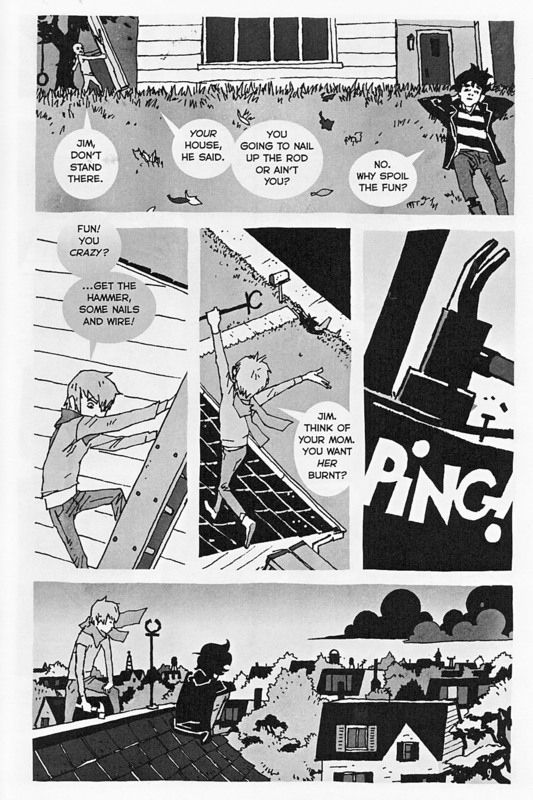 The volume features 160 pages of stunning black and white artwork. 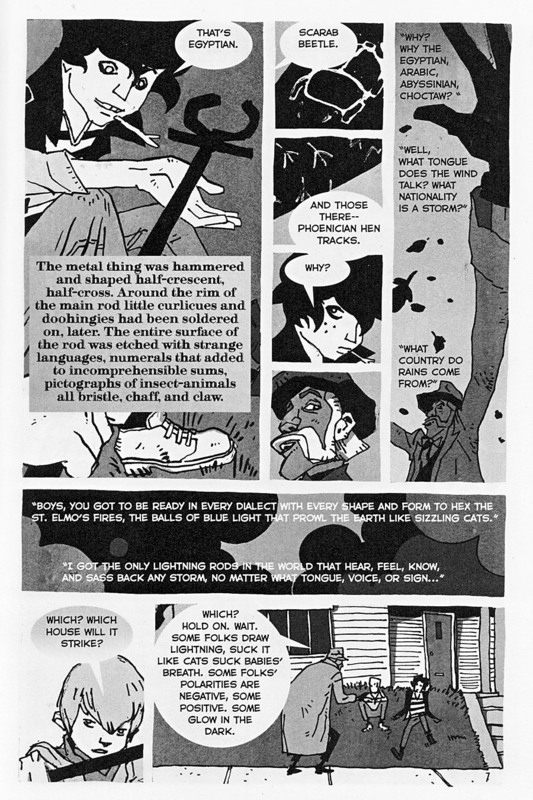 Wimberly is a graphic novelist in the split traditions of Hokusai and Hugo Pratt. His work has appeared in Metal Hurlant (Heavy Metal) and DC Comics’ Vertigo imprint on several titles, including the critically acclaimed graphic adaptation of the autobiography of rapper MF Grimm, Sentences, an Eisner Award-nominated work. 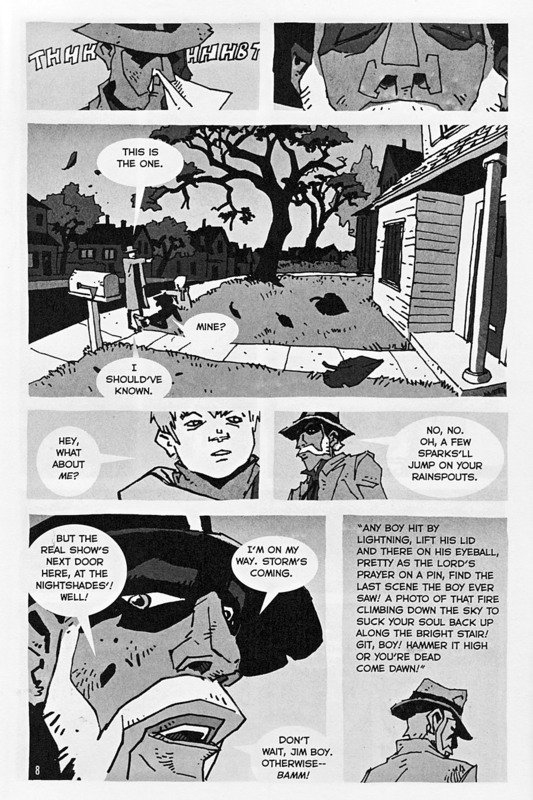 Something Wicked This Way Comes is Ray Bradbury’s incomparable work of dark fantasy, and the gifted illustrator Ron Wimberly has stunningly captured its sinister magic in gorgeously realized black-and-white art. 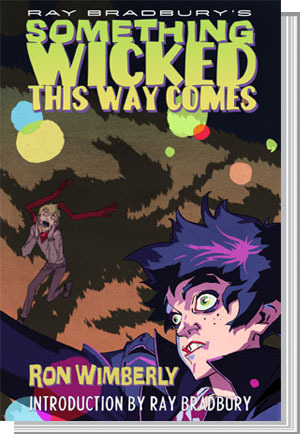 Complete with an original introduction by Bradbury, Ray Bradbury’s Something Wicked This Way Comes: The Authorized Adaptation reintroduces this thrilling classic.
. . . This volume does an impressive job of adapting Ray Bradbury’s classic novel. The plot is preserved, will all the key scenes translated to the new medium. Even better, passages of of Bradbury’s poetic prose have been interspersed throughout, recreating the atmosphere of the original novel.
. . . I don’t hesitate to recommend this book, which will certainly appeal to fans seeking a new taste of an old favorite. 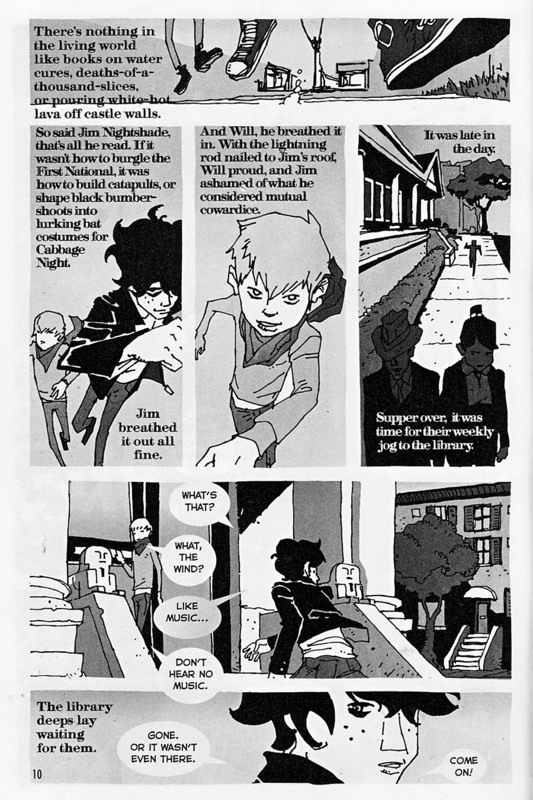 And for younger readers not quite ready to tackle the full-length novel, this graphic adaptation can meantime serve as a wonderful primer. The mix of comic book style illustrations with Bradbury’s genre-blending and poetic literary sensibility is well matched. . . . Interpretations and re-imaginings give artistic work renewed life, be it a sample of an old Latin song in a hip-hop track or a short film adaptation of a story. These books do the same for . . . Bradbury’s best-loved classics that blend science fiction and fantasy with the poetic language of literary fiction. 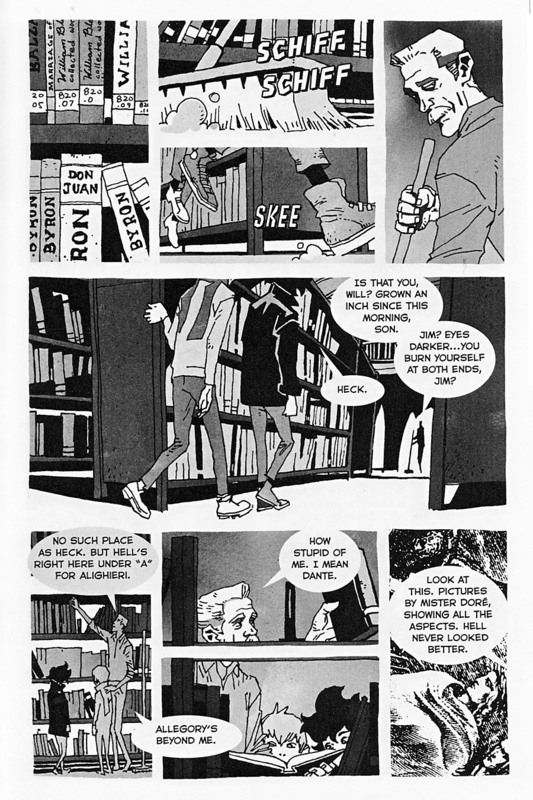 One of the unique advantages of the graphic novel form is its cinematic ability to interplay images with text and utilize the nuance of facial expression, gesture, and contrast: speech and action, shading and light. . . . The black-and-white artwork plays with shadow and light, capturing the ominous essence of the allegorical novel and its themes of age, power, and the struggle of good to win out over evil. and seasons of a life. Ray Bradbury is a writer of mysteries, science fiction, horror, fantasy and mainstream fiction, and is widely considered one of the greatest and most popular American writers of the twentieth century. He has written novels, short stories, plays, poetry, screenplays, and teleplays. Many of his works have been adapted for television and film. His most popular books are the novels Fahrenheit 451 and Something Wicked This Way Comes, and the story collection The Martian Chronicles. Since his work was first published in the 1940s, Bradbury has received many awards. Among these is a special citation from the Pulitzer Prize Board in 2007 for his “Distinguished, prolific, and deeply influential career as an unmatched author of science fiction and fantasy.” He has also received the National Medal of Arts, A World Fantasy Award, The Science Fiction and Fantasy Writers of America Grand Master Award, and an Emmy Award, among others. 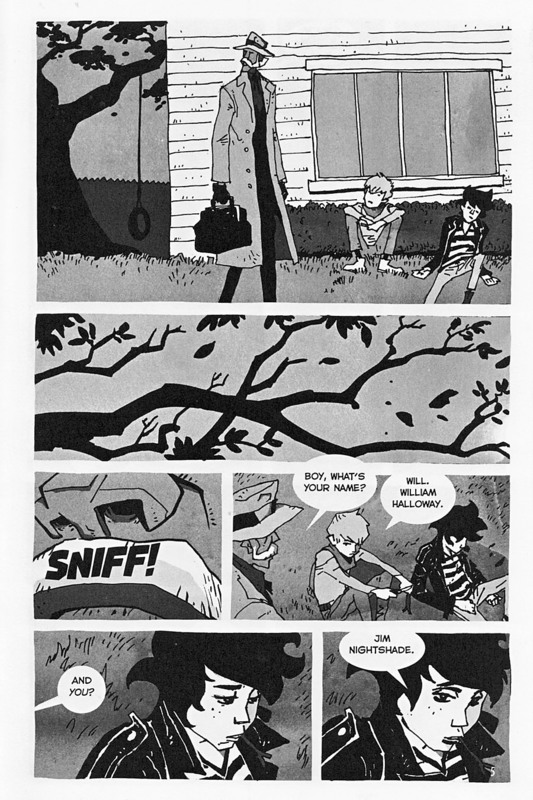 Ron Wimberly is a Brooklyn Author and Artist. He’s shown in Metal Hurlant, and has worked for Dargaud and DC Comics’ Vertigo Imprint on several titles, including the critically acclaimed biographic novel of underground rapper MF Grimm Sentences: The Life of MF Grimm. He keeps a journal of his thoughts, work, and experiments at D-PI.com/DTV.